The principals of the company have been providing first class services to the vessel owners in the North West Atlantic since 1956. The initial business relationship developed with the deep sea fleets of Western Europe. At that time, the waters around Newfoundland and on the Labrador Coast teamed with cod. The salting vessels from the Faroese Islands, Norway and Portugal found a relaible Newfoundland supplier, Alec D. Moores, to maintain their distant water fishing operations. The business rapport, that began over 40 years ago, is maintained in the shrimp fishery today. The international industry is now firmly established inside the Canadian zone and in NAFO area 3M. It is the opportunity and challenges that such activity provides that has always been of utmost interest to our company. The associations and resulting friendships that have been generated are extremely important. These most valuable connections are cherished. All individuals who make up the management and staff "team" work with the simple motto: "There are those in Newfoundland who may be able to do things as well but absolutely no one can do it better." The main activities of the company are marine related. However, Harbour International Limited is also a buyer and processor of both buleberries and lingonberries. 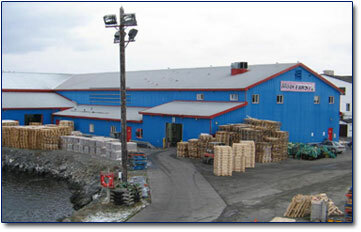 At its main base of operations in Bay Roberts the company provides stevedoring, cold storage, ships agency and other related materials handling services to offshore fishing vessels and cargo vessels. The underlying motivation of our company is to always have the customers interest at heart. Our reputation within the industry is without reproach. Whatever the task, we are all striving to provide the very best service possible to our greatly appreciated clients.